★★★★☆ First of: its good value, and it has a nice design. It would be perfect if a lightning stand was included. Now you need to use a loose cable to charge your phone. 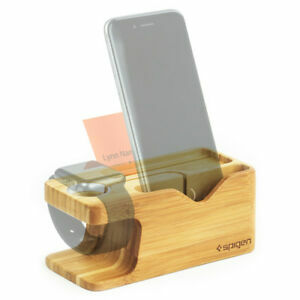 ★★★★★ Another Amazing Product By Spigen, Well Fabricated And The Bamboo Texture Gives It A Nice Look. The Apple Watch Charging Placement Fits Correctly. If You Using The Dock To Charge Your Iphone It Can Be A Little Challenging With The Cable Placement. ★★★★★ I loved the product makes it easy for me to just placed the phone, and my watch to charge instead of trying to reach for the charging cables under the bed. ★★★★★ Well designed. The only thing that could have improved the functionality would be if the watch charging dock could be placed in a way for night stand mode. Otherwise it does what it is supposed to do. My iPhone 7+ fits perfectly in the phone area even with a case on it.